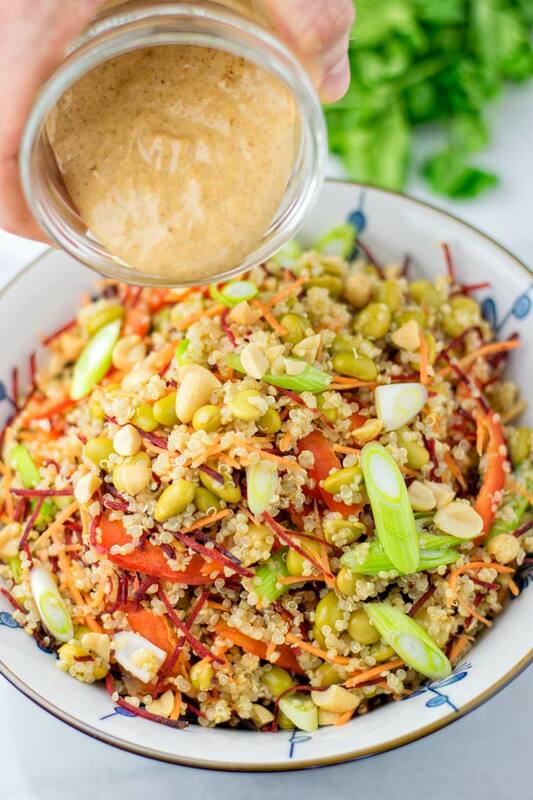 This fresh and crunchy Thai Quinoa Salad is covered with an amazing Thai peanut dressing. It’s naturally vegan and such a keeper for 15 minute meals and meal prep which the whole family will love. We all look for easy dinner recipes for family which will not break the bank. Yummy meals that are super easy to make and even the kids will love. Quinoa is my to go when it comes to healthy lunch ideas. 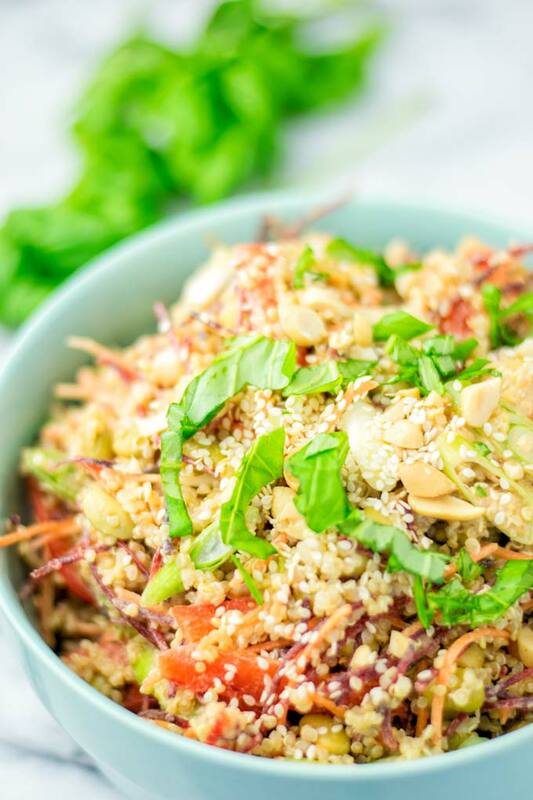 This Thai Quinoa Salad will make you really happy. It is easy, packed with flavors, hearty, filling, satisfying, crunchy with the roasted peanuts on top and a must make for all your easy make ahead meals. With these nourish bowls, everyone will love veggies. It’s one of those quinoa recipes like this Quinoa Taco Salad [vegan, gf] that gets everyone excited about quinoa. 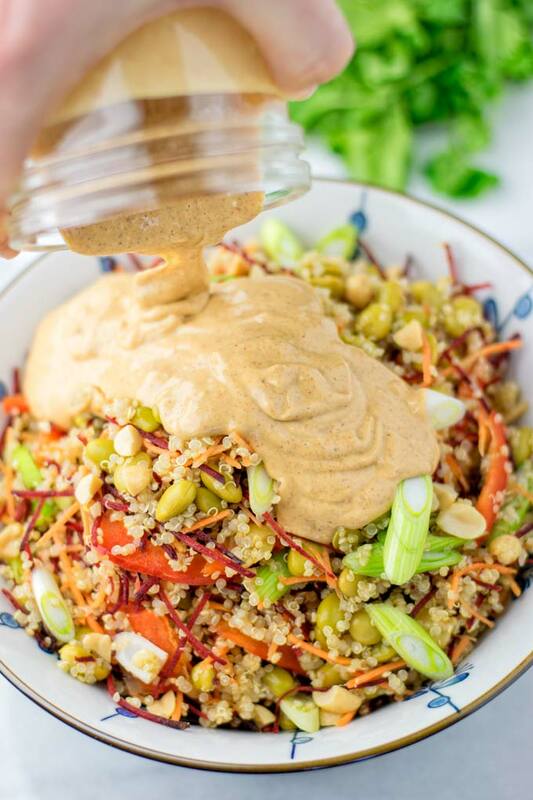 So I used my Thai peanut sauce recipe for this Thai quinoa salad which is seriously the best sauce I’ve tasted and made. It couldn’t be get any easier than this quinoa salad. 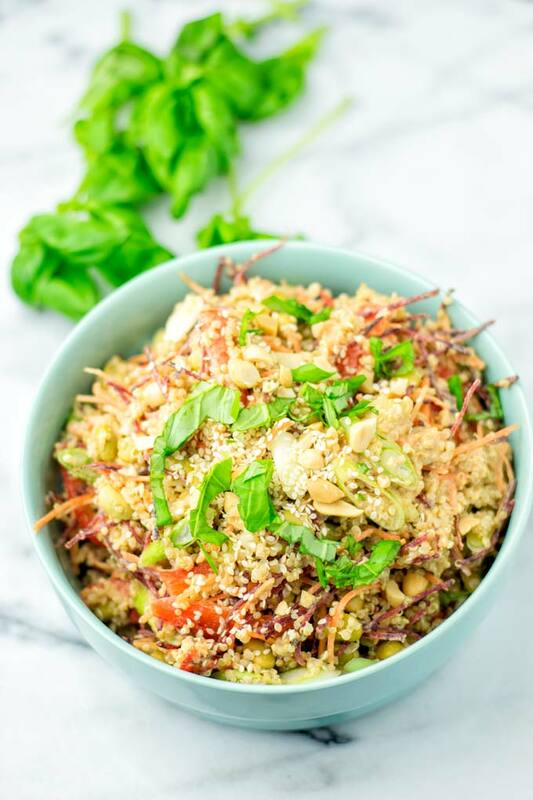 Just combine cooked quinoa, shredded carrots, edamame, bell pepper, optional scallions, shredded beets. Finally put chopped peanuts on top, put the Thai peanut dressing on it, and mix everything well until incorporated. Divide on plates, or bowls and serve immediately or chill. Note: The Thai Peanut Sauce recipe makes a big batch. Which is fantastic since I love my salad recipes with a good amount of sauce. Also I find myself often snacking it with a spoon. If you ever have leftovers, it will keep fresh in a sealed airtight container for around 5 days. All of this makes this dish a time saver for healthy meal prep. You can double the batch and keep it fresh for your healthy snacks on the go. It is just lovely as peanut dipping sauce for all your veggies like broccoli, carrots, celery and so much more. Also seriously mouthwatering for all your veggie chips, burger sauce, sandwich spread, so versatile, dream big and enjoy! 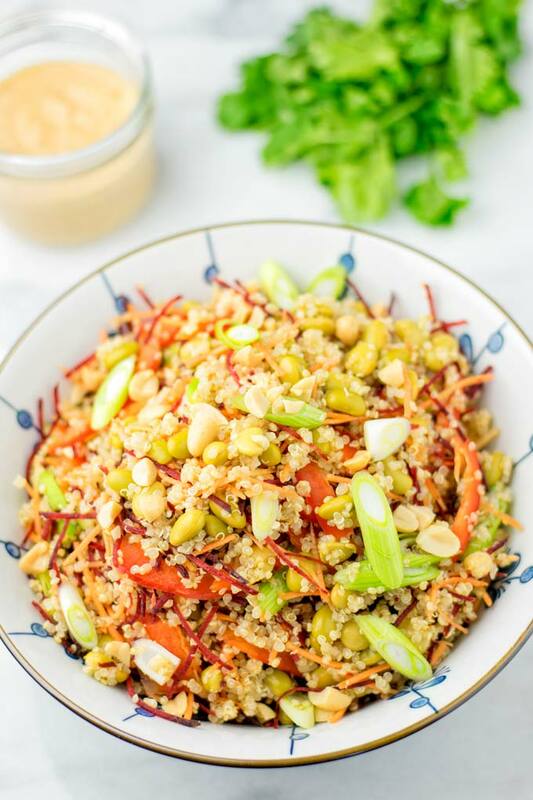 This Thai Quinoa Salad is a must make for your quick dinners, if you plan make ahead meals. The flavors are even better when made in advance. A great option for any lunch box, bento lunch box, kids bento box. Indeed it makes such a great side dish for all family members and lunch containers. If you plan this for your potluck ideas, you can easily make a double batch. 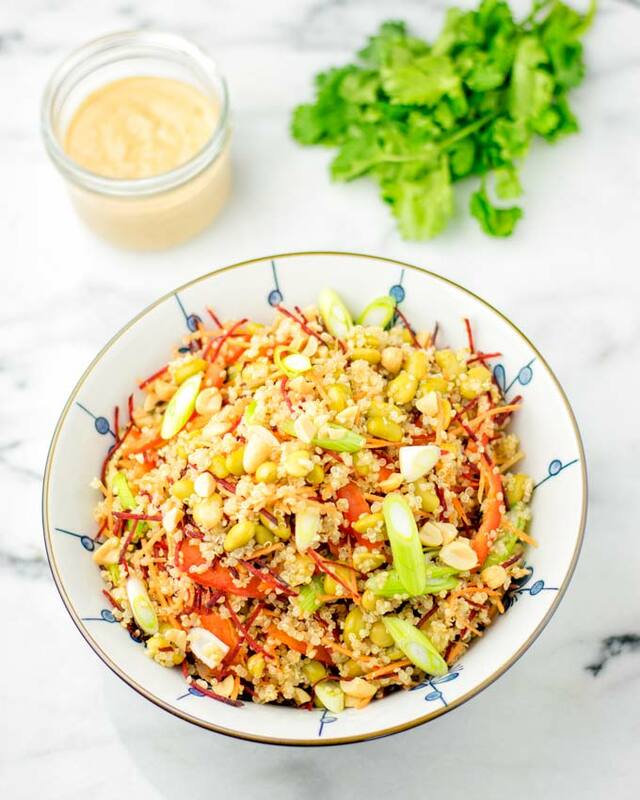 You can make this Thai Quinoa Salad up 3 days in advance. Delicious and simple for your party appetizers it will complement to anything. What’s really essential when making any quinoa salad? Right, fluffy quinoa! I found out it makes any dish so much better. It’s my to go tutorial from the kitchen: How To Cook Fluffy, Tasty Quinoa. Once I started to cook quinoa this way, I found myself not turning back to other quinoa cooking instructions. If you’re looking for more quinoa food look no further use the search bar type “quinoa” and enjoy more quinoa meals. 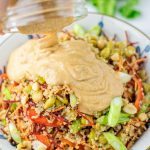 Give this Thai Quinoa Salad a try, tag me on Instagram or Facebook. 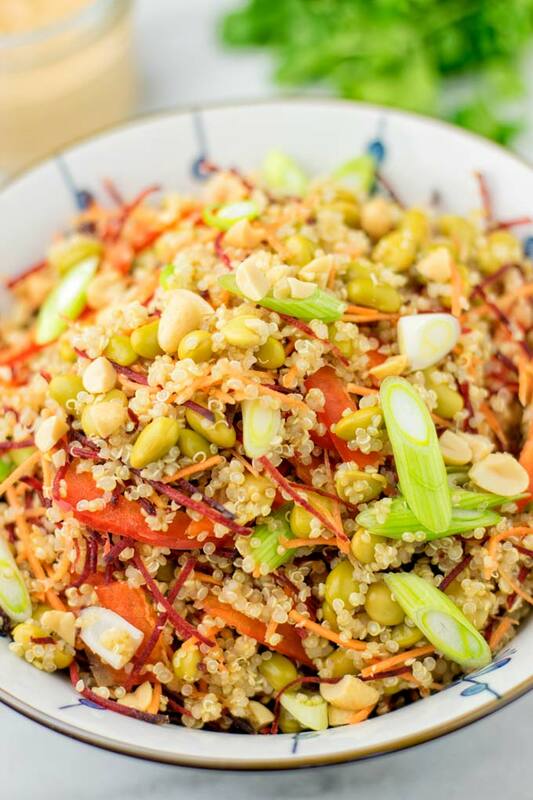 Just combine cooked quinoa, shredded carrots, edamame, bell pepper, optional scallions, shredded beets. Finally put chopped peanuts on top, put the Thai peanut dressing on it, and mix everything well until incorporated.